Q - "Handbrake problems help! I used to use handbrake to rip DVD movies but now I can't even do it anymore. I have a new laptop. When I got it all set up and ripped the next DVD, the pictures and sound are all scrambled. Should I download and install the libdvdcss.dll? How can I do this? Please don't recommend any alternatives that have only trail versions. Free DVD rippers that don't require any payment will be fine. Oh and I'm a Windows 10 PC user." Firstly, libdvdcss was removed from this free DVD ripper version 0.9.2, and you can only find libDVDNav in HandBrake 1.2.0 under Tools > Preferences > Advanced > DVD Reading. HandBrake cannot rip DVDs encrypted with CSS ever since. Secondly, whether downloading and installing VLC libdvdcss Mac/Windows solves "HandBrake won't work" problem depends on the type of your DVD copy protection. Last but not least, there are giveaways of best DVD rippers, some of which are way better than free ones and normally cost you 40-50 bucks. [Solution] Can't Rip Protected DVD without libdvdcss Mac, Windows? Download install libdvdcss.pkg/libdvdcss.dll will solve your problem, but limitedly. It is strongly suggested that you remove DVD encryption with WinX DVD Ripper Platinum. • Remove DVD CSS, UOP, RCE, region code and Sony ARccOS. • Rip DVD to MP4, MPEG, MOV, WMV, iPhone, iPod, Apple TV, Android, PSP, Xbox, etc. • Support sources like DVD discs, ISO files and folders. Rips at NO.1 fast speed. To sum up, libdvdcss is part of the VideoLAN project, which alone is only a library that can find and guess keys to do the DVD decryption, so that CSS-protected DVDs will be played correctly. Together with media player software and DVD rippers, such as VLC and HandBrake, libdvdcss helps read and decrypt DVDs of different regions or encrypted with CSS. And because it uses a generated list of possible player keys, libdvdcss has never been legally challenged. The latest version is libdvdcss 1.4.1.
libdvdcss is used only for free software, like HandBrake to decrypt DVD. libdvdcss is allowed to run on Mac OS X (libdvdcss El Capitan error), Windows NT 4.0 SP4 (with IE 5.0) or later, Linux, FreeBSD, NetBSD, OpenBSD, Haiku, Solaris, QNX and OS/2. VLC installed with libdvdcss supports DVDs of all regions (1-6) only if you have RPC1 drives, for raw access to RPC2 drives can't be made successfully, which however is required to circumvent the region protection. Step 2: You don't have to rename libdvdcss-2.dll as libdvdcss.dll. Just cut and paste the downloaded libdvdcss 2 file in your HandBrake program folder. If you didn't manually set the installation path before, it normally is "C:\Program Files\HandBrake"
Step 3: And that's all for installing HandBrake libdvdcss on Windows (10). Step 1: libdvdcss.pkg download Mac OS X. Step 2: Double click the downloaded file to install libdvdcss on Mac. But note that there is one more step for installing libdvdcss on Mac El Capitan, because of its SIP (System Integrity Protection), which is said to remove libdvdcss by default. We found two workarounds: disable SIP and a more complicated but recommended way from a Reddit user (as below). 1. Open a Finder window -> type "cmd+shift+G" or click "Go" and choose "Go to Folder" -> copy and paste /Library/SystemMigration/History/ -> press button "GO" -> open the folder "Migration-[random letters and numbers]" and find "QuarantineRoot" -> libdvdcss file should be in this folder. 2. Again click "Go" on the taskbar -> "Go to Folder" -> type "/usr/local/lib". 3. Cut and paste your libdvdcss file to the folder "/usr/local/lib" -> put in your admin password to finish the move and libdvdcss installation on Mac is done. As we said before, libdvdcss is mainly for using in free DVD ripper like HandBrake to rip DVD encrypted with CSS. But the point is that there are many other kinds of DVD copy protections besides CSS, such as Sony ArccOS, UOPs, and Disney X-project DRM. If you are trying to rip Inside Out DVD with HandBrake libdvdcss, there might be a "HandBrake won't rip" problem, due to its up to 98 fake titles. 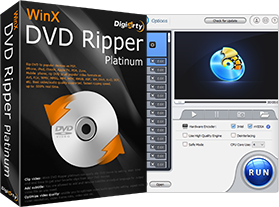 If you feel like downloading installing HandBrake libdvdcss Mac/Windows is a little bit annoying and just want a much more professional and easy-to-use HandBrake alternative, try WinX DVD Ripper Platinum, which keeps constant updating to support all kinds of latest DVD copy protections. For example, it supports ripping Disney movie DVDs on Windows 10 at ultra-fast speed to MP4, AVI, MOV, MPEG, iPhone, iPad, Android, etc (350+ built-in profiles), due to flexible CPU use settings and support for hardware accelerated video encoding decoding technology MMX- SSE, 3DNow! and Hyperthreading. The newest HandBrake 1.2.0 added hardware acceleration support for Nvidia NVENC and AMD VCE. UHD videos like 4K have extremely high requirements for your equipment, especially the support for hardware acceleration. But to maximally use your hardware, try this Level-3 GPU accelerated DVD ripper, Level-3 GPU accelerated video converter. To decrypt any protected DVDs to MP4, AVI, MOV, WMV, iPhone, iPad, Android, Samsung, HTC, etc. on Mac/Windows, please try WinX DVD Ripper Platinum! HandBrake DVD Ripper: How to Use HandBrake to Rip DVD Movies?